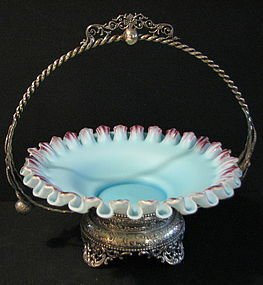 This ornate sterling silver tea strainer is by Stieff in the Chrysanthemum pattern. It is clearly marked on the back. There is an, "R," monogram on back of the handle. It weighs 83 gms. and is in very good condition. This is a rare soup plate for the Baltimore & Ohio Railroad circa, 1830's. It is by Enoch Wood & Sons, Burslem, Staffordshire, England. It features Tom Thumb on flat plain. The Tom Thumb was the first American built steam locomotive to operate on a common carrier. It is dark blue with a shell border. The diameter is 10 1/4 inches. There is glaze crazing on the back. The front is mint. Impressed mark. This lioness bronze paperweight was made by Tiffany Studios, New York prior to 1920. Very nice detail on the figure. It is signed, "Tiffany Studios New York 887." Edouard Gilles was the master of Barbotine. This vase is in the planter style and dates 1868-1895, It has his initials in a raised oval on the bottom along with the number, 244. It measures 11 inches wide by 7 1/4 inches high. Very fine condition with vibrant colors. This Arts & Crafts vase was made by Heintz Art Metal Works circa 1910. It is sterling on bronze, #3622A. The name of the design is, "Goldenrod." It stands 12 inches high. Very nice warm patina. A few rubs on one area of the back. Stamped on the bottom. 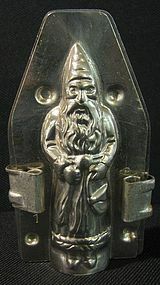 This is a very small antique German chocolate mold. Father Christmas stands just 4 inches high and is 2 1/4 inches wide. The clips are original. Very nice detail. The manufacturer and the number 990 are stamped on the inside. This sweet day dress is made of organdy and has hand done embroidery and smocking. The edging is French lace with a ruffled hem. Two tiny buttons form the back closure. The underslip is made of the same fabric and has buttons at the shoulder making it easy to put on and take off. The gathered puffed sleeves and embroidered bib at the neck complete this perfect toddler dress. The dress measures 19 inches from the back neck to the bottom. It dates between 1900-1920. Mint condition. This early ice cream scoop has been professionally cleaned and polished. The rare conical shaped scoop is nickel plated. 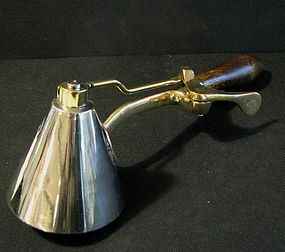 The wooden grip is attached to a polished brass handle and release mechanism. The mechanism works very well. This # 33 scoop was made by the Gilchrists' Co., in New Jersey. It dates circa 1914. The scoop diameter is 3 inches and the length is 10 1/2 inche. Very fine condition with one extremely tiny ding on the scoop. This beautiful piano stool is made of mahogany and dates circa 1860. It features a 16 inch diameter seat that rests atop a tapered cylinder with an ormolu mount around the bottom. The tripod base rests on three bronze paw feet. The stool turns up to, at least, 22 inches. The bottom has the name of the Maryland owner scratched into the surface. Very fine condition.